The TriggerSmart is designed to easily capture images using many different ways to trigger a camera using Sound, Light Intensity Increase, Infra-Red Beam Breaking and Movement. The new TriggerSmart MKII Control Unit is a wireless enabled addition to the Sabreswitch range of controllers. It is an affordable triggering solution for all photographers wanting to capture movement. The product enables the user to easily capture images that would otherwise be impossible or difficult to achieve and allows precise repetition! 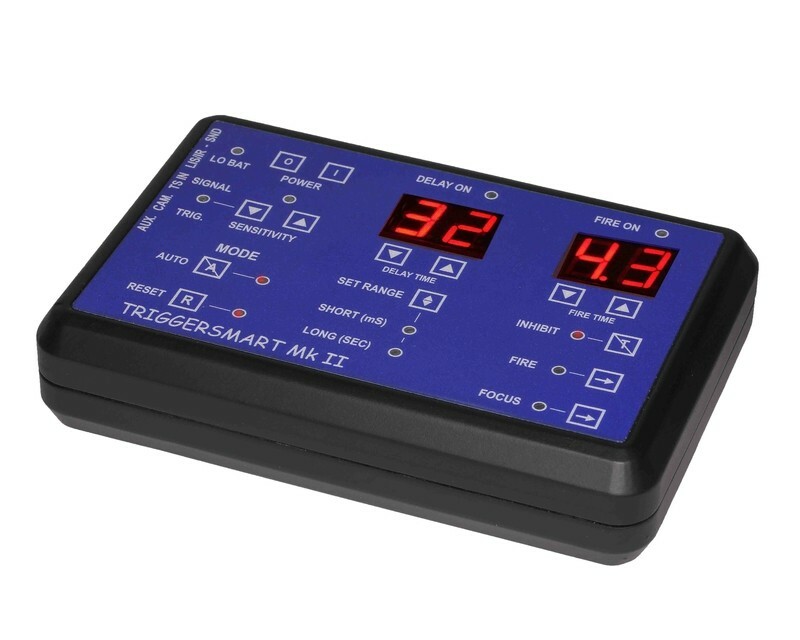 The TriggerSmart MKII Control Unit in conjunction with either a wired or wireless TriggerSmart Sensor (sold separately) allows DSLR, Mirrorless and CSC cameras to be be triggered by breaking an invisible IR beam, an increase in light intensity, a sudden sound or tilting movement of the subject. The new Wireless Multi Sensor (sold separately) can sense IR beam (requires IR Transmitter), light intensity and sound. It also includes an auxiliary input enabling the use of wired TriggerSmart sensors such as TriggerBeam, TriggerScout and Tilt without the need for cables connected back to the Control Unit. The controller connects to your camera via a cable and to a sensor via either wireless or cable. TRIGGER MODES - Manual, auto 1 shot, auto re-arm. FOCUS ACTIVATION - Manual activation. SENSOR MODES - Flash, infrared beam, sound. POWER CONSUMPTION - About 25 milliamps. SIZE - (W)15cm x (D)10cm x (H)3.5cm.